PC/104 has been an excellent choice for applications with long design cycles, such as military avionics, command-and-control applications, rail and transportation systems, and legacy industrial devices. Designers of these solutions know how to handle the long-term commitment and obsolescence challenges that come with such systems. In newer video and imaging applications, PC/104e is getting some looks. When users want to create embedded video or imaging application, they find that PC/104 boards and systems are the right choice for their designs. PC/104 provides a compact yet easily expandable architecture. It is suitable for harsh environments where imaging applications may be needed, thanks to its rugged and reliable connectors. It’s resistant to shock and vibration, which can be important for imaging. And of course, it’s compatible with PCs, which keeps down development cost and time. Plenty of products are still being introduced that meet this venerable and proven specification. In particular, PCIe/104 offers many of the interfaces an imaging application may need, such as four-port Gigabit Ethernet (GbE) and USB 3.0 connections. Moreover, it maintains flexibility for future expansion. The PCIe/104 OneBank expansion interface for high-performance systems has enabled smaller, lighter, and more energy-efficient solutions. One recent example of a vision system that takes advantage of PCIe/104 is a fish-counting system developed for the National Marine Fisheries Service by PC/104 Consortium members ADL Embedded Solutions Inc., and RTD Inc. The Service needed a camera system that could withstand the vibrations of a trawler in the water while providing real-time image processing. 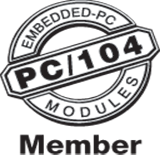 Several companies have products that are compatible with the PCIe/104 standard. They include the H264-HD-2SDI from Advanced Micro Peripherals (Figure 1), the Lion rugged PC/104 single-board computer from VersaLogic, Coaxlink Duo PCIe/104 from Euresys, the OI110 dual-camera link from Sundance Technology, the SK220 PCIe/104 carrier module from Perfectron, the Model 953-ET encoder/decoder from Sensoray, and Connect Tech’s Xtreme/GPU. Figure 1: The dual HD-SDI H.264 encoder for PC/104-Express from Advanced Micro Peripherals enables designers to add high-definition HD-SDI video capture with H.264/MPEG-4 AVC (Part 10) encoding to their embedded PC equipment designs. COM Express, meanwhile, has taken off in gaming for slot machines; newer industrial applications for manufacturing automation; robotics; and military intelligence, surveillance, and reconnaissance (ISR) payloads for unmanned aircraft. It’s also getting some play within the Internet of Things (IoT). “It is being used to operate subsystems, for instance. Mostly subsystems have a box with some I/O added to it and use COM Express as a controller,” Keeler continues. “In areas where you don’t need high compute power, you can build a standalone solution that leverages a NVIDIA Jetson TX2, for instance. The enticing thing about COM Express is its flexibility when it comes to multiple pinouts and module sizes that are all available right off the shelf. It also has multiple display and video outputs with 16 lanes of PCIe x16 or two PCIe x8 outputs, which translates to a lot of I/O coming in a small package. You can also tailor the compute power based on SWaP requirements – from a Xeon to a Core i5. As Kasza mentions, the latest update to COM Express adds server-grade functionality to COM Express embedded computing systems. Revision 3.0 of COM Express provides for a new Type 7 connector and the addition of up to four 10 GbE interfaces on the board, according to the PCI Industrial Computing Manu­fac­turers Group (PICMG). The organization says previous revisions of the specification were limited to a single GbE interface. The higher speed ports enabled by the update open up new markets such as data centers, where the high compute density of COM Express can result in increased rack utilization. The 10 GbE ports are also ideal for high-bandwidth video applications such as surveillance. Another change to the specification includes increasing the number of PCI Express lanes to 32 across the Type 7 connector, a move that provides a wealth of connectivity and interface options. These include the ability to facilitate the use of general-purpose graphics processing units (GPGPUs). COM Express growth: Emblematic of the strength of the overall computer-on-module market. “Computer-on-module market growth is just outstanding for certain types of form factors, and COM Express crosses both industrial and military lines,” says Mike Southworth, a product marketing executive with Curtiss-Wright Defense Solutions (Ashburn, Virginia). “When we started to integrate COM Express modules into our system architectures, we reduced our legacy system size by more than 25 percent, increased system technology reuse, and overcame our traditional thermal-management challenges. “COM modules works quite well for reduced SWaP applications in avionics and other applications that require the smallest SWaP possible,” Southworth adds.